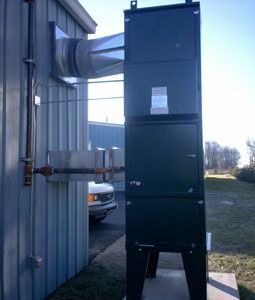 The public garage in Whitehouse, OH was formerly heated using a unit heater. This method, however, was very inefficient and didn't work in tandem with the exhaust fans in the building to help control the buildup of CO from the municipal vehicles moving in and out of the space. AbsolutAire provided an AA-Series that had the ability to switch from an outside air (OA)/return air (RA) system, to a 100% outside air system. In the winter mode when heat was needed in the space, the unit operated in OA/RA mode to help keep energy costs down. The unit only switched to the 100% OA mode when the CO detector sensed a buildup of CO in the building. The AbsolutAire unit was also provided with two exhaust fan interlocking relays that allowed it to control the exhaust fans as well. In addition to the OA/RA option, the unit also had a programmable time clock, on/off/auto switch, and occupied/unoccupied cycle stats that allowed for precise control of the unit, also helping to keep energy and heating costs down.